A reflection group comprising of several select European foreign ministers has met within the last few weeks to discuss the possibility of creating an EU 'super-president' that would combine the roles of President of the European Council and President of the European Commission, currently held by Herman Van Rompuy and Joel Manuel Barroso respectively. The ratification of the Lisbon Treaty in 2009 established the positions of EU President and EU High Representative for Foreign Affairs, effectively giving the European Union 'one voice' on the world stage for the first time. 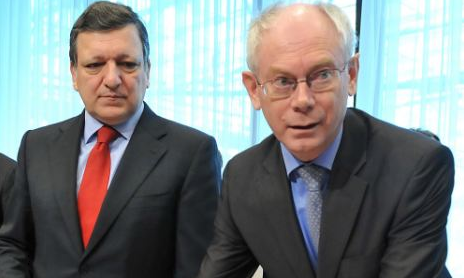 As President of the European Council, Van Rompuy has been given the legal authority to address the United Nations in a similar way that the President of the United States would. The European Council is a group comprising of the heads of state and elected governments of the member states of the European Union, and are collectively responsible for guiding the political direction of the EU as a whole. But President of the EU Commission, Manuel Barroso also represents the European Union on the world stage. He presides over the executive arm of the European Union, which is responsible for proposing the legislation that is subsequently passed by the European Parliament and member state governments. The new position of EU 'super-president' would merge both roles, stream-lining decision making, but also putting an awful lot of political power into the hands of just one man. Whoever fills this role will effectively have more political power than the US President, but will be less democratically accountable, for he will be selected by the European Parliament rather than being directly elected by the people. (Express.co.uk)—Opponents fear the plan could create a modern-day equivalent of the European emperor envisaged by Napoleon Bonaparte or a return to the Holy Roman Empire of Charlemagne that dominated Europe in the Dark Ages. Unfortunately that's exactly what the architects of the European Union hope to create. It's not just the Euro-skeptics who are saying these things. Manuel Barroso himself, when asked what the end-game of the European project actually was, responded that the EU was the world's first “non-imperial empire”. And when Belgian politician Paul-Henri Spaak was asked how he felt upon signing the Treaty of Rome, which formally established the European Community—the forerunner to the European Union—he remarked that "we felt like Romans on that day... We were consciously recreating the Roman Empire once more". Now the empire is looking for its emperor. Of course these statements will come as no surprise to those who study Bible prophecy. For the prophecies of Daniel and Revelation do seem to indicate that the final world empire, the one that will exist at the coming of the Lord Jesus Christ, will be a revived form of the old Roman Empire. Daniel 9:26 identifies the Antichrist—here referred to as the 'prince that shall come'—as being of the people who would destroy the city of Jerusalem in 70 AD. Daniel's visions of the four beasts in chapter seven, which represent the four world empires that would rule over the nation of Israel until the time of the end, also identify the Roman Empire as being the one that will exist at the return of Christ—albeit in a deteriorated form. And just as the Scriptures foretell the rise and fall of this final world empire, they also predict the rise of a man that will rule over it. Whether the man that will fill this position will be the Antichrist or not is impossible to tell, but one thing is sure, the way is certainly being prepared for his arrival. That's not the end of the story. You may recall that the book of Daniel accurately predicted the fall of the Babylonian empire. He witnessed the rise of the Medo-Persian empire, and described in vivid detail the conquests of Alexander the Great long before the events actually took place. He prophesied of the crucifixion of the Messiah and the destruction of the Second Temple by the hands of the Romans. He wrote about the final world empire and its Satanically inspired ruler. But he saw something else that made everything pale in comparison. He saw the Lord. I saw in the night visions, and, behold, one like the Son of man came with the clouds of heaven, and came to the Ancient of days, and they brought him near before him. And there was given him dominion, and glory, and a kingdom, that all people, nations, and languages, should serve him: his dominion is an everlasting dominion, which shall not pass away, and his kingdom that which shall not be destroyed (Daniel 7:13-14). That day which Daniel wrote about is drawing near. Jesus Christ is coming back. But the question is, are you ready to meet Him? How do I get ready, you may ask. Just by telling God that you are a sinner, and by thanking Him for sending the Lord Jesus Christ into the world to be your Saviour. He loves you. And He died for you so that your sins might be forgiven, and you could have everlasting life with Him in heaven. Why don't you turn away from your sins, and put your trust in the Lord Jesus Christ for salvation today.